The Fifty Fathoms collection by Blancpain has fascinated horologists for over fifty years. 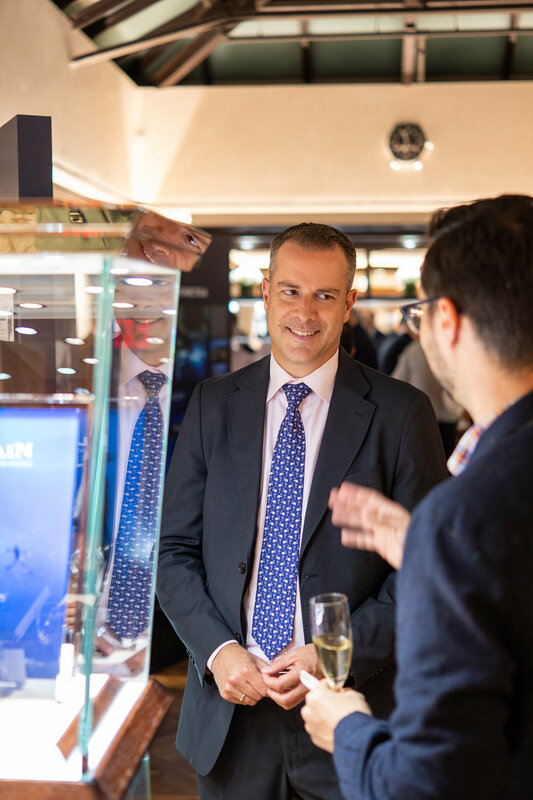 An integral part of the evolution of dive watches, Blancpain’s exhibit is an impressive collection showcasing each step throughout history that led to Fifty Fathoms holding such prestige amongst collectors. The collection’s name is inspired by a line from Shakespeare’s The Tempest, a work that has spurred its own myth and conjecture, being Shakespeare’s last original work with seemingly personal implications. 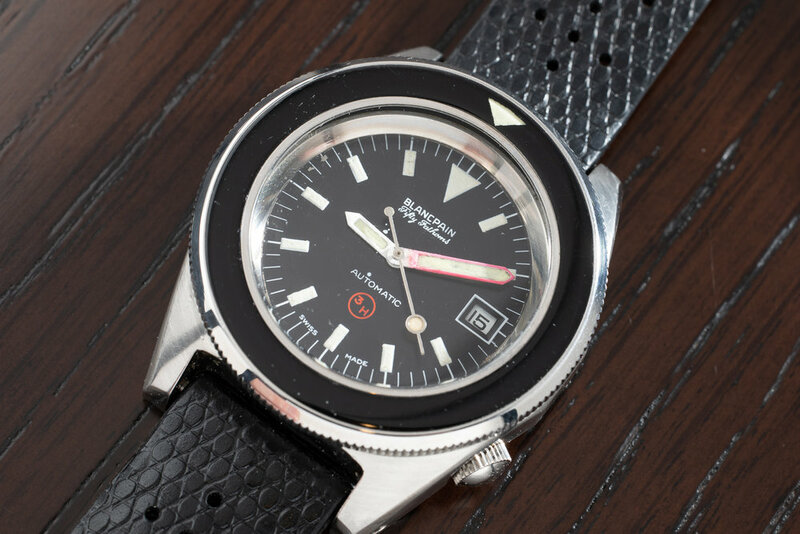 It’s fitting then that the lines between myth and history regarding the Fifty Fathoms collection itself were blurred for so long with conjecture and misunderstood information until Blancpain, Jeffrey Kingston, and others made efforts to get a closer look. 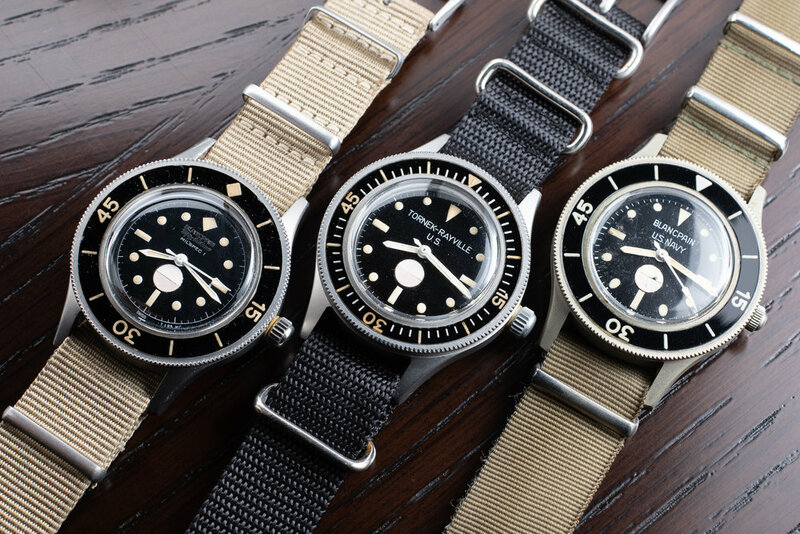 Jean-Jacques Fiechter, director of Blancpain in the 1950s and a diver himself, joined over five clubs in his time, and was drawn towards diving when it was predominantly a militarized market. For many, being mindful of time can mean the difference between life and death, and for divers this was significantly intensified by circumstance. It was Fiechter’s own experience with this truth that led to the creation of the Fifty Fathoms collection. During a dive, he lost track of time and ran out of air. Emerging from the water in time, the experience inspired him to prevent others from encountering the same situation, leading his work to save many lives and become instrumental in the expansion of combat diving corps around the world. 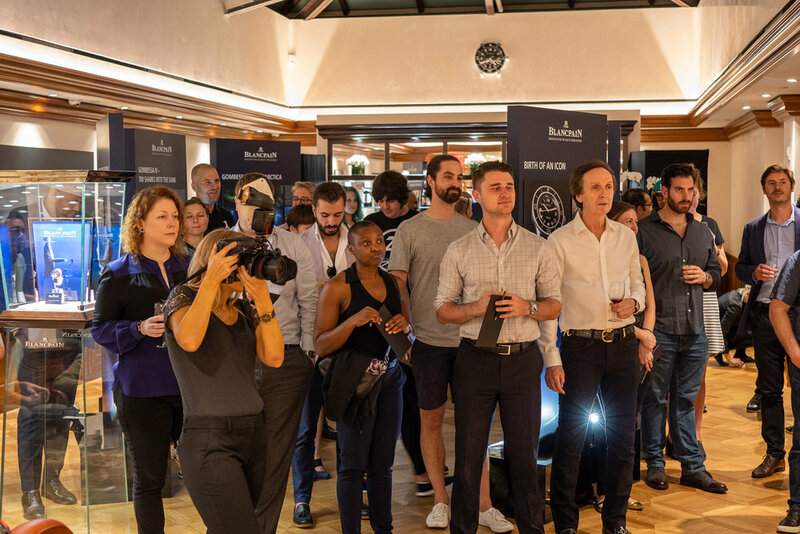 For those of us in the watch world, there’s an understanding that seemingly small events such as Fiechter’s dive may lead to affecting our daily wrist wear, as was apparent by the number of Blancpain and dive watches featured among the exhibition attendees. Although the common myth behind the launch of Fifty Fathoms tells of the French Navy approaching Blancpain with specs that were then used to make the first dive watch, it has since been revealed Jean-Jacques Fiechter already had a working model featuring the signature qualities: water tightness, large diameter, high contrast for marking visibility, locking rotating bezel, and automatic winding. The French asked that anti-magnetism be added due to the important role magnets had in underwater combat at the time. The exhibition story then shifts gears visually, detailing how the German Navy asked for a simplified bezel with only one marker, and a screw down crown not part of the original design because Jean-Jacques had prioritized water tightness. Thus, the German Bund model was created. Soon after the Bathyscaphe followed, a model with a smaller diameter for everyday wear that featured a date window. This is where the US Navy enters the narrative and things get even more unusual. While some of the requirements were fairly standard, like pressure testing, the US Navy set a higher bar overall as more unusual tests were asked for, such as dropping a 40” steel ball directly on the crystal to see if it would break. One interesting result of the US entry into this journey is the addition of moisture indicators. The US military, unlike other countries, assigned watches as part of the standard equipment a person was given for their dive, which was retrieved directly after for another soldier's use, making a moisture indicator a powerful tool to save the lives of divers who otherwise would not have known if the equipment they were using had been compromised. As the journey continued, both Rolex and Bulova ended up in the running to be used by the US Navy but neither passed the testing required at the time. After about five years, the deal was struck between the US Navy and Blancpain. As a result of this and other agreements, other unique details on pieces developed such as the “Rayville” models and the “no radiation” logos added to dials. An interesting feature added to the MIL-SPEC2 was a lower magnetic signature by using a beryllium case and a matte finish. Although these days things like matte finishes are often thoughts of as aesthetic touches, both new features for the MIL-SPEC2 had much more functional reasoning. Having a low magnetic signature made the watches safer for divers who might interact with magnetically detonated underwater bombs, while the matte finish would help maintain a diver’s low detect-ability. Seeing this exhibit showcase such a narrative through history with care is truly a rare treat. Due to militarized destruction of many Fifty Fathoms models, it can be hard to find them on the market, let alone laid out so beautifully in such a well rounded and full collection. Leave it to Blancpain to be the masters of their legacy and its history. If you haven’t seen the collection yet, we heartily recommend it. Although our experience may have had the added benefit of delicious food and an open bar, any opportunity to see this collection is well worth the trip.